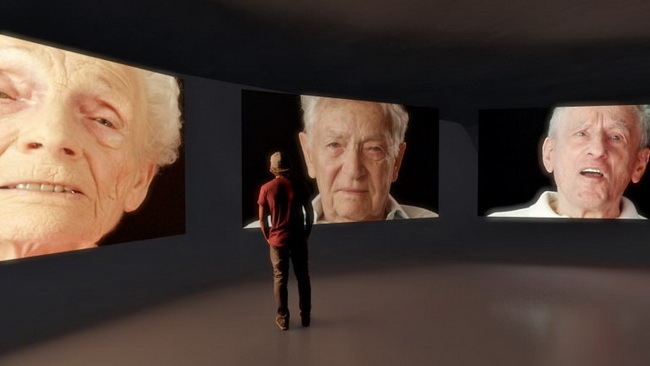 Mirrors is an immersive multi-media art installation of 6 larger-than-life high-definition video portraits of six living Holocaust survivors. 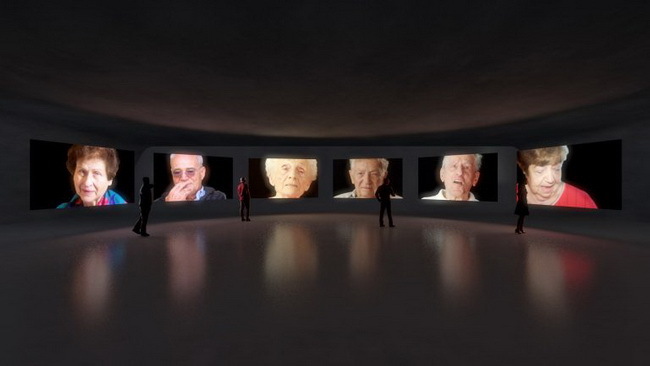 Each survivor is displayed on their own screen, telling their own story in their own voice sharing thoughts on life, death, luck and faith. Edited with precision and intimacy, the survivors speak one at a time, for only a few minutes each, while the others, remain calm, quiet, looking, blinking, wetting their lips, wrinkling their faces, patiently waiting for their turn to speak again, until after several hours, their stories are all told in full. 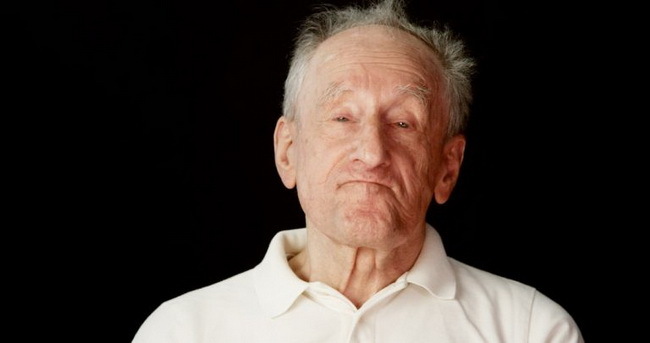 Utilizing installation and film and emanating from the history of portraiture, Mirrors is an intense and emotional modern documentary and an unprecedented artistic approach to the conventions of Holocaust discourse by presenting individual vignettes that together create a layered portrait of the generation of survivors. The overall narrative includes reoccurring motifs of strength, optimism, and chance while investigating themes such as transformation, fate, and memory within the realm of an extraordinary chapter in world history. The result is a powerful and complex series of films that aim to create a forum for reflection, discovery, education, and the social conscience of survival, going beyond individual story telling to examining the multi-faceted and ever-changing complexities of how the self and the cultural and social implications of the Holocaust are perceived and presented to the world. The title, Mirrors connotes the concept of reflection – of a person, idea, or time mirroring layers of meaning and purpose and points to the viewer’s personal interactive role in the installation. Each survivor is interviewed in-front of a seamless black background with minimal makeup, lovingly lit and shot with ultra high definition cameras. 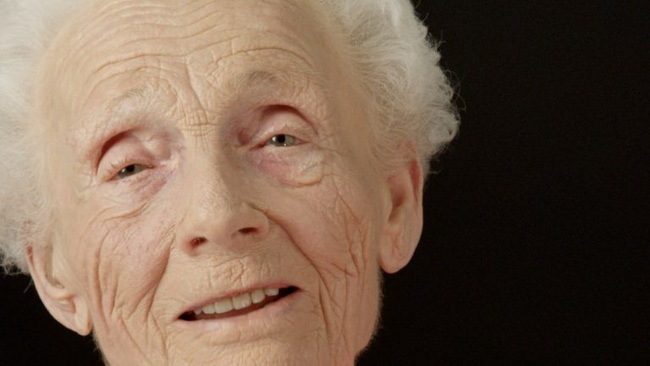 Eyes glistening, story filled wrinkles, lips trembling and voices breaking come together to create an intimate portrait. Marc’s direct and warm questions allow the survivors to feel at ease; Liron’s visual style is honest and pure, giving the portraits the dignity and honor they deserve. 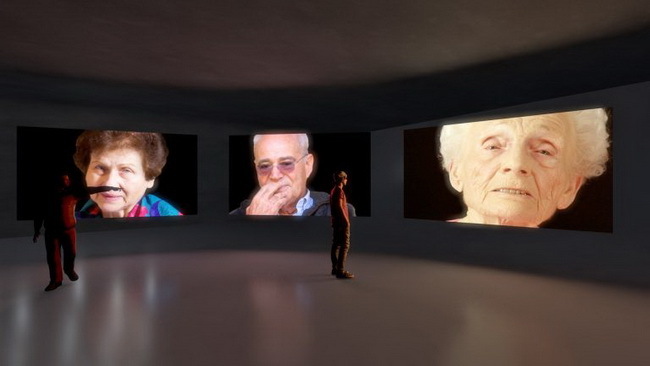 The six video portraits are displayed using high-definition projectors on 60” high screens. The show can also be installed in a range of exhibition venues and screen sized. Marc Dennis: An American artist known for his hyper-realistic paintings of staged images of contemporary culture that celebrate the subversive potential of beauty and the charged subjects of identity, pleasure and decadence. Interested in transformative possibilities Dennis merges various movements throughout the western art historical canon with fashion advertising and pop cultural tropes in order to create witty, provocative and symbolic paintings that play on our psychological, cultural, and spiritual relationships. His works have been included in numerous group and solo exhibitions in New York, London, Los Angeles, Chicago, Miami, Boston, Houston and Seattle among others. 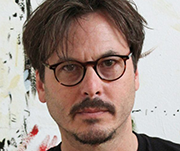 His works are in numerous private and public collections, including those of John and Amy Phelan, Glenn and Amanda Fuhrman, Bill and Maria Bell, Beth DeWoody, Larry Gagosian, Larry and Marilyn Fields, David and Jennifer Stockman, Carl and Donna Hessel, Courtney and Karen Lord, Nancy Rogers, Michael Danoff and Jo Laird, Sean and Tammy McCarthy, The Neuberger Berman Collection, New York; The Blanton Museum of Art, University of Texas at Austin; The Springfield Museum of Art, Ohio, and the Iris & B. Gerald Cantor Center for Visual Arts at Stanford University, Palo Alto, California among others. Born in Danvers, Massachusetts in 1971, Dennis was one of five sons. He received his B.F.A. from Tyler School of Art of Temple University in Philadelphia, PA and his M.F.A. from The University of Texas at Austin. He lives and works in Brooklyn, NY with his wife, Rebecca and their two young children, Zayla and Azev. Liron Unreich: As a grandson of Shoah survivors the story of the Holocaust and its after effects have been present throughout his life. He is the co-founder and Director of The Ripple Project an independent media company that endeavors to connect audiences with stories of extraordinary events, momentous discovery and remarkable shifts. 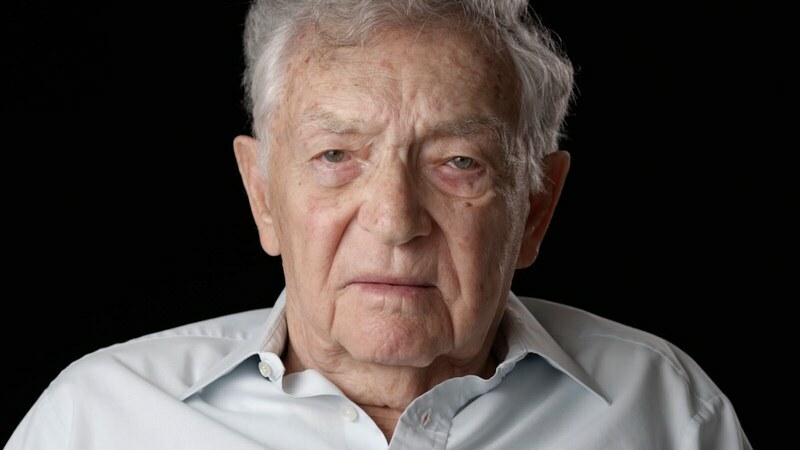 The project’s shot films have centered around the after-effects of the Holocaust with great critical success. He is a graduate of New York University Tisch School of the Arts and has pursued the art of storytelling through various mediums. His resumé reflects his expertise in a variety of arenas — including award winning films, worldwide art exhibitions of collaborative work, participating in the design of the highest resolution 360° digital video array ever built and independent film productions. 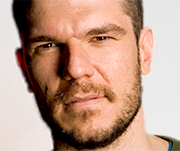 His independent and collaborative work has been featured on television, in museums and publications around the world. He lives and works in Brooklyn, NY with his wife, Sarit and their two young children, Leeba and Lavie. “Mirrors” – Video Installation Trailer from The Ripple Project on Vimeo. “Mirrors” – Marc Interview with Dina Trailer from The Ripple Project on Vimeo.